Having deployed from Devonport on 17 August, the type 23 frigate HMS Somerset made good progress towards her operating area and has recently relieved HMS Monmouth. Once across the Mediterranean, Somerset dwelled a pause at Soudha Bay, Crete, where she undertook an Operational Capability Confidence Check (OCCC) at the NATO Forces Sensors and Weapons Accuracy Check Site (FORACS) range. The range enabled the accuracy of the frigate’s communications and sensors to be measured and assessed. Having been given the all-clear, Somerset proceeded through the Suez Canal into the Red Sea towards Aqaba, Jordan, where she took over from her off-going sister ship. As HMS Somerset commences duties in theatre, the ship’s company are firmly focussed on defending worldwide trade routes and the deterrence of threats to UK prosperity, whilst maintaining the strong reputation of the UK. The Royal Navy is conducting Maritime Security Operations under international maritime conventions, ensuring security and safety in international waters. Such constabulary duties encompass counter-terrorism and counter-piracy operations, as well as targeting narcotics and people smuggling. An end to the regional monsoon season is expected to herald an increase in illegal activity. A key facet of Somerset’s maritime security tasking is the execution of boarding operations. Her ship’s company have been preparing for this deployment since returning from the Gulf in December last year, and have been rehearsing drills throughout her transit into theatre. The 180-strong crew has been bolstered to 205 by the embarkation of 829 Naval Air Squadron Merlin Flight and a Royal Marine boarding team from the Fleet Protection Group Royal Marines (FPGRM). As a coherent unit, HMS Somerset is able to contribute to her mission by using her long range sensors and helicopter to detect and identify suspect vessels, and conduct boarding operations from the sea or air. On sailing from Aqaba Somerset conducted manoeuvres with the Royal Jordanian Naval Force fast patrol boat King Abdullah. Such exercises help reinforce partnerships with the UK and Jordan, and provide reassurance of international cooperation and shared aims. Throughout Somerset’s deployment her ship’s company will continue to promote stable and co-operative relationships with friendly and neutral nations with whom she has contact. However, she will remain at readiness to respond to any tasking, ranging from humanitarian aid to full maritime or littoral conflict. Powerful and versatile with the capability to operate anywhere in the world, the Type 23 frigate is the mainstay of the RN surface fleet. The 13 Type 23 frigates form 50% of the total frigate/destroyer force in the Royal Navy. Originally designed for the principal task of anti-submarine warfare, they have evolved into multi-purpose ships with the capability to operate anywhere in the world. The effectiveness of these ships is enhanced by their stealth design, which reduces their radar signature significantly. In addition to warfare roles, these ships also conduct embargo operations using boarding teams inserted from the ship’s boats or helicopter, disaster relief work and surveillance operations. 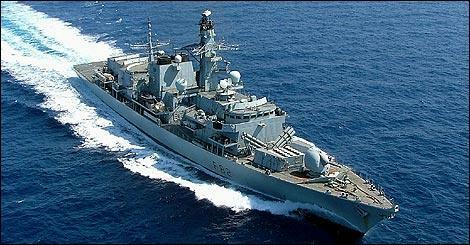 The present HMS Somerset is the fourth to bear the name and was built by Yarrow Shipbuilders Ltd in Glasgow. She was launched on 24 June 1994 on the Clyde by Lady Elspeth Layard, wife of the then Second Sea Lord, Admiral Sir Michael Layard, and commissioned on 20 September 1996. Follow HMS Somerset on Twitter @HMS_SOMERSET.